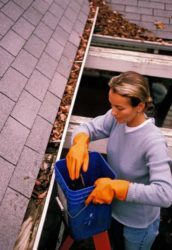 Cleaning gutters is one of the many fall chores you should do before winter. * This is a repeat post but worth posting again as winter will be here before you know it. Make sure your furnace is ready. You don’t want to be stuck on the first cold day of the season without heat. Change filters and stock up on new ones. Schedule a repair if needed. Heating professionals are busy and become even busier when the unprepared realize too late that their furnaces need fixing. Get your chimney checked by a professional and have it cleaned. Animals like to build nests in chimney flues which is a safety concern, as is creosote buildup. For more information on the care and keeping of chimneys, visit the Chimney Safety Institute of America’s website. Test your smoke alarms. You should be doing this monthly as it is, according to the Federal Emergency Management Administration (FEMA). The agency recommends replacing the batteries at least once a year and replacing units every 10 years. Blow out your sprinkler system. Turn off outside spigots and drain them as well. Cold weather can cause freezing, which is an expensive headache you won’t want to deal with later. Clean gutters. Clogged gutters prevent water from properly draining and can also fill with ice and cause snow buildup on your roof. The weight from snow, and then subsequent leaking from melting snow, can seriously damage your roof. Clean and dry patio furniture and store it away from the elements. Trim bushes and branches that are near the house to prevent damage during severe weather. For more tips, read this. Then get to work! And if you have any useful tips that have worked for you, let me know in the comments! This entry was posted in DIY and tagged chimney, furnace, gutters, home, ready, smoke alarms, sprinkler system, winter. Bookmark the permalink.